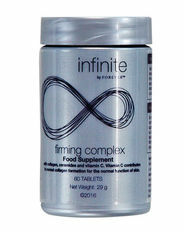 COMING SOON Focus on nutrient skincare with Firming Complex, Forever’s first exclusive beauty supplement. This supplement is an inner conditioning complex that helps target the appearance of premature ageing and it’s been specially formulated to assist beauty from within. We’ve combined vitamin C to help with healthy collagen formation in the skin, biotin to maintain healthy hair and skin and we’ve even added extra marine collagen. Collagen is an amino acid packed protein which occurs naturally in the body to give structure and tone to connective tissues. Take two tablets daily. For best results, consume in the morning. Marine collagen hydrolysate (fish), Calcium L-ascorbate, Ceramides extract (wheat), anti-caking agent (silicon dioxide), melon juice concentrate, hydrogenated palm oil, acidity regulator (dicalcium phosphate), biotin. Allergy advise: See ingredients in bold.